Dens invaginatus(DI) is a developmental malformation resulting from invagination of the crown or root of the tooth before its calcification. It is associated with a complex internal anatomy. The most affected teeth are the upper incisors. Early diagnosis is beneficial, because teeth with this malformation are more susceptible to decay and pulp necrosis, often requiring surgical or non-surgical endodontic therapy. This case describes the diagnosis and management of a type 2 DI in a maxillary lateral incisor of a 16-year-old female aided by the use of cone-beam computed tomography (CBCT) and a dental operating microscope. CBCT was performed to assess canal anatomy and periapical lesion size. The tooth had no response to cold with pulp testing and was diagnosed as an Oehlers type 2 DI with necrotic pulp and periapical abcess. The treatment was planned and performed based on CBCT imaging. CBCT was performed to assess canal anatomy and periapical lesion size. Root canal treatment was completed in a single visit. Filling of the canals was performed using Tagger’s hybrid technique. At the 1-year follow-up session, the patient was asymptomatic, and the tooth had remained functional since treatment completion. Radiographic assessment of the tooth showed significant osseous healing of the preoperative lesion. The treatment of DI reported herein was greatly enhanced by the use of CBCT and a dental operating microscope. Dens invaginatus (DI) is a developmental anomaly resulting in deepening or invagination of the enamel organ into the dental papilla prior to calcification of the dental tissues . Rushton  suggested that the etiology of DI was embryological, with the stimulation and subsequent proliferation and in growth of cells of the enamel organ into the dental papilla during development. In contrast, Kronfeld  considered that the problem was the result of the retardation of a focal group of cells, with those surrounding continuing to proliferate normally. The incidence of DI ranges from 0.04% to 10% . This wide incidence discrepancy may be associated with the different definitions of the anomaly owing to anatomical variations . The upper incisors are the most frequently involved teeth . The first incidence survey of DI was published by Hallett , but the most commonly used classification for the anomaly was proposed by Oehlers . The author described the occurrence of this malformation in three ways: Type 1: Invagination ends as a blind sac within the crown; Type 2: Invagination extends apically beyond the cemento enamel junction; Type 3: Invagination extends beyond the cemento enamel junction, and a second apical foramen is evident. Capar et al. reported the prevalence of each type of invagination, type 1 being the most common (65.9%), and type 2 (29.5%) and 3 (4.6%), less frequently observed. The authors found the highest incidence of dens invaginatus was found in maxillary lateral incisors (75%), followed by mesiodens (9%) and maxillary central incisors (6.8%). DI was also seen in lesser percentages of mandibular premolars, maxillary canines and mandibular canines. In most cases, this anomaly is detected by chance during radiographic examination or by the presence of symptoms, since affected teeth may not show clinical signs of malformation. Grossman  and Creaven  were the first authors to describe the treatment of a root canal with invagination. Mader  and Holand and Block  presented the first cases treated with conventional therapy. Complete DI should be treated by a specialist to avoid risk of complications . Nonsurgical endodontic therapy , endodontic surgery , intentional replantation , conservative restorative treatment  and extraction  have all been reported as treatment modalities. In cases of type 1 DI, only restorative treatment or sealing of the cavity is required. In type 2 and type 3, endodontic treatment is indicated, with or without endodontic surgery, since, in most cases, the teeth have a necrotic pulp . Knowledge of internal dental anatomy is essential to performing a complete cleaning and shaping of the root canals. Conebeam computed tomography (CBCT) is recommended as an effective diagnostic device for identifying DI because it provides an accurate representation of the external and internal dental anatomy. Because CBCT allows a three-dimensional visualization of the canal system , the information it provides is essential to the management of this type of anomaly. The true nature of DI often cannot be estimated based solely on conventional radiographs. With the latest developments in equipment and materials, it is now possible to save even severe cases of dens invaginatus . The purpose of this case report was thus to describe a single-visit endodontic treatment of a non-vital type 2 DI. Female patient G. S. S, age16, was referred by her orthodontist, who detected a DI in a maxillary right lateral incisor during routine radiographic examination. Clinical examination showed that the tooth and surrounding soft tissue were healthy (Figure 1A). There was no visible decay or previous restorations. The tooth did not respond to cold thermal testing (Endo Ice; Coltène- Whale dent Inc, Cuyahoga Falls, OH, USA), although all of the adjacent teeth responded within normal limits. Figure 1A: Intraoral clinical examination. Radiographic evaluation revealed an invagination into the pulp chamber of the tooth, and there was periapical radiolucency. Two canals were visualized: the main canal located distally, which tapered progressively toward the apex, and an invaginated canal located mesially and separate from the main root canal (Figure 1B). 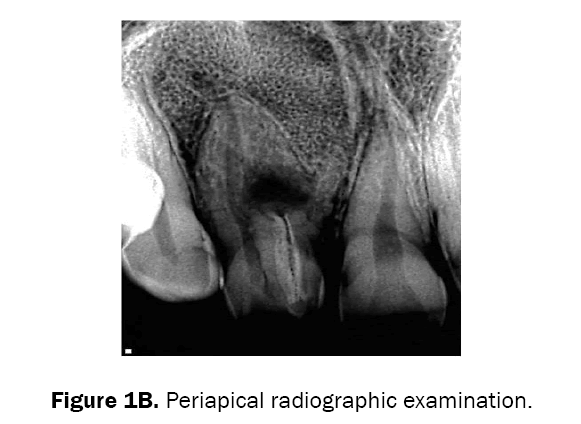 Figure 1B: Periapical radiographic examination. A CBCT scan was performed with an I-CAT apparatus (Kavo-Kerr, Joinvile-SC, Brazil). The images revealed a periapical radiolucency which was larger than that observed radiographically (Figure 2). The diagnosis of Oehlers type 2 DI with pulp necrosis and a chronic apical abscess was established for the maxillary right lateral incisor. 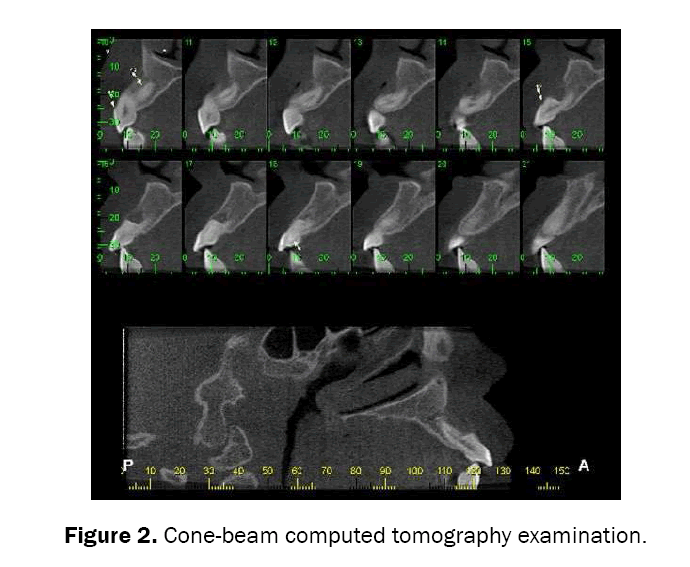 Figure 2: Cone-beam computed tomography examination. After clinical, radiographic and tomographic examination, root canal treatment was planned. The patient’s mother gave written informed consent for treatment. Local anesthesia was performed with labial infiltration of 3.6 mL of 2% lidocaine with 1:100,000 epinephrine (Alphacaine, DFL, Rio de Janeiro, RJ, Brazil).After rubber dam isolation, the entire endodontic procedure was performed under a dental operating microscope (Alliance, São Carlos, SP, Brazil). The access cavity was prepared using a carbide bur (KG Sorensen, Cotia-SP, Brazil). Both the main canal and the root invagination were initially instrumented with a #15 C pilot file (VDW, Munich, Germany) under irrigation with 2.5% sodium hypochlorite (NaOCl). The cleaning and shaping of the main canal was performed with the WaveOne Large reciprocating instrument (Dentsply-Maillefer, Ballaigues, Switzerland); (Figure 3A). The cleaning and shaping of the mesial canal were performed with the wave one primary reciprocating instrument (Dentsply-Maillefer) (Figure 3B). Figure 3A: Intraoperative radiographs depicting cleaning and shaping procedures with Waveone large instrument. 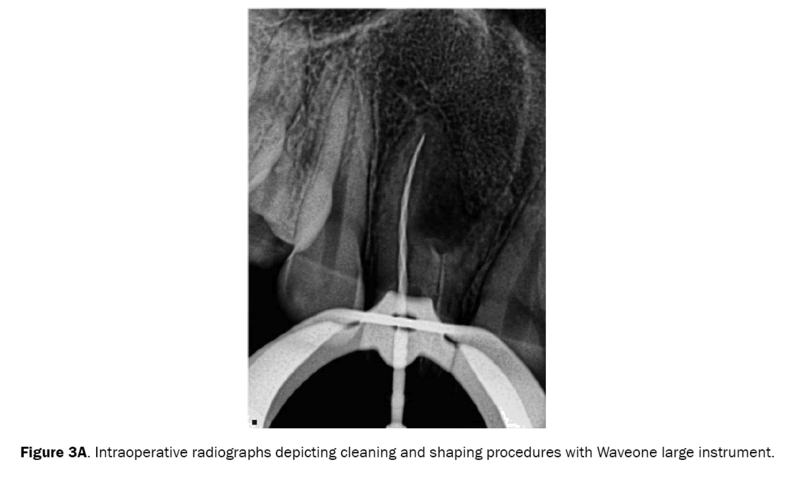 Figure 3B: Intraoperative radiographs depicting cleaning and shaping procedures with Waveone primary instrument. Final irrigation was performed with 17% ethylenediaminetetraacetic acid (EDTA) followed by 2.5% NaOCl. Both solutions were agitated with a reciprocating instrument (EasyClean; Easy Equipamentos Odontológicos, Belo Horizonte, MG, Brazil) to enhance cleaning . The root canals were then dried with absorbent paper points (Dentsply-Maillefer). Filling of the root canals was performed with the Wave One Large and Primary gutta-percha points (Dentsply-Maillefer) in the main (distal) and root invagination (mesial) canals, respectively, following Tagger’s hybrid technique , and using a #60 gutta-percha condenser (John T. Mc Spadden, Dentsply-Maillefer) and AH Plus cement (Dentsply-Maillefer). The access openings were temporized with Cavit (3M ESPE, St. Paul, MN-USA). The patient was referred to her general practitioner for permanent restoration. After one year, the patient returned asymptomatic, the tooth was functional and had no sensitivity to percussion or palpation. The radiographic assessment of the tooth showed significant osseous healing of the preoperative lesion (Figure 3C). Figure 3C: One-year follow-up image. DI is a dental anomaly originating in developing teeth, which can produce a pulp chamber connection with the oral cavity. Affected teeth may require restorative treatment, endodontic treatment and/or surgery, which is often complicated owing to their complex anatomy. The endodontic treatment of these teeth with apical lesions usually involves complicated procedures that require both correct diagnosis and appropriate planning . According to the studies by Smit et al. , the morphology of the main canal is irregular, circular or narrow. One possible explanation is that the invaginated tissue is compressed within the main canal at different levels. Pulp necrosis and an acute periradicular abscess are often observed in cases of DI . Nonsurgical endodontic treatment should be the first choice regardless of the severity of apical periodontitis. Surgical treatment should be the second option, and, when none of these options issuccessful, tooth extraction is required . DI in maxillary lateral incisors is quite common, and cases have been reported in the literature over the last decade . Nosrat  presented a rare case of DI in a maxillary lateral incisor with 5 canals. Some authors [27,28] have reported cases of DI in maxillary canines. Owing to the anatomical configuration of a DI, there may be technical difficulties in performing clinical procedures. Thermoplasticized gutta-percha can be useful for sealing anatomically complicated pulp spaces . The importance of performing clinical and radiographic follow-up of all treatments is warranted to avoid future problems, and this should be incorporated into the endodontist’s routine . In the present case report, a single-visit endodontic treatment of a permanent lateral incisor, classified as a type 2 DI, associated with a periradicular lesion, was described. Owing to the high complexity of the root canal system, and in order to avoid problems during treatment, the entire endodontic treatment, including access cavity preparation of the two canals, was performed under magnification using a dental operating microscope (DOM; Alliance, São Carlos, SP, Brazil), and the case was planned and treated based on CBCT imaging. The magnification, focus and illumination provided by a DOM are essential for diagnosing correctly, locating and treating the entire root canal system , and CBCT images enable detailed 3D guidance to the operator. There are several recent reports in the literature [26,27,30] where CBCT imaging was used in the management of DI cases. Pulp necrosis almost inevitably results in loss of the tooth, because the shape of the root canal system virtually precludes endodontic or surgical treatment . Nevertheless, in the present case, the effective cleaning and shaping of the canal system under magnification, along with use of Tagger’s hybrid technique, aided in successfully filling irregularities in the root canal system, which, in turn, was the basis for the successful regression of the lesion observed one year after treatment. The agitation of the irrigating solutions provided by the Easy Clean system was considered crucial in complementing the root canal disinfection procedure. This case illustrates that even in a tooth with Type 2 dens invaginatus and an associated periradicular lesion, nonsurgical endodontic treatment without surgical intervention, can result in satisfactory periradicular healing. The resolution of the periapical radiolucency was observed at 12 month follow-up examination. In conclusion, the three-dimensional imaging provided by CBCT is an invaluable tool for endodontic management of teeth with complex internal anatomy, and is therefore recommended for the assessment and treatment planning of DI cases [26,30]. Hϋlsmann M. Densinvaginatus: aetiology, classification, prevalence, diagnosis, and treatment considerations. IntEndod J.1997;30:79–90. Rushton. A collection of dilated composite odontomas. Br Dent J. 1937;63:65–85. Kronfeld R. Dens in dente. JDent Res. 1934;14:49–66. Hovland EJ and Block RM. Non- recognition and subsequent endodontic treatment of dens invaginatus. J Endod. 1977;3:360–362. Tagger M. Nonsurgical endodontic therapy of tooth invagination. Report of a case.Oral Surg Oral Med Oral Pathol. 1977;43:124–129. Bimstein E andShteyer A. Dilated type of dens invaginatus in the permanent dentition: report of a case and review of the literature. ASDC J Dent Child. 1976;43:410–413. Hallett GE. The incidence, nature, and clinical significance of palatal invaginations in the maxillary incisor teeth. Proc R Soc Med. 1953;46:491–499. Oehlers FA. Dens invaginatus (dilated composite odontome). Variations of the invagination process and associated anterior crown forms.Oral Surg Oral Med Oral Pathol. 1957;10:1204–1218. Capar ID, et al. A retrospective comparative study of cone-beam computed tomography versus rendered panoramic images in identifying the presence, types, and characteristics of dens invaginatus in a Turkish population. J Endod. 2015;41:473–478. Grossman LI. Endodontic case reports. Dent Clin North Am. 1974;18:509–527. Creaven J. Dens invaginatus-type malformation without pulpal involvement. J Endod. 1975;1:79–80. Mader C. Triple dens in dente. Oral Surg Oral Med Oral Pathol. 1977;44:966. Zoya A,et al. Double dens invaginatus with multiple canals in a maxillary central incisor: retreatment and managing complications. J Endod. 2015;41:1927–1932. Hosey MT and BedI R. Multiple dens invaginatus in two brothers. Endod Dent Traumatol. 1996;12:44–47. BolanosOR, et al. A unique approach to the treatment of a tooth with dens invaginatus. J Endod. 1988;14:315–317. Lindner C, et al. A complex treatment of dens invaginatus. Endod Dent Traumatol. 1995;11:153–155. De Sousa SM and Bramante CM. Dens invaginatus: treatment choices. Endod Dent Traumatol. 1998;14:152–158. Steffen H and Splieth C. Conventional treatment of dens invaginatus in maxillary lateral incisor with sinus tract: one-year follow-up. J Endod. 2005;31:130–133. Patel S. The use of cone beam computed tomography in the conservative management of dens invaginatus: a case report. IntEndodJ. 2010;43:707–713. Kato AS, et al. Investigation of the efficacy of passive ultrasonic irrigation versus irrigation with reciprocating activation: an environmental scanning electron microscopic study. J Endod. 2016;42:659–663. Chen YH, et al. Dens invaginatus:review of formation and morphology with two case reports. Oral Surg Oral Med Oral Pathol Oral RadiolEndod. 1998;86:347–352. De Smit A and Demaut L. Nonsurgical endodontic treatment of invaginated teeth. J Endod. 1982;8:506–511. Whyman R and Mac Fadyen EE. Dens in dente associated with infective endocarditis. Oral Surg Oral Med Oral Pathol. 1994;78:47–50. Kfir A, et al. The diagnosis and conservative treatment of a complex type 3 dens invaginatus using cone beam computed tomography (CBCT) and 3D plastic models. IntEndod J. 2013;46:275–288. Nosrat A and Schneider SC. Endodontic management of a maxillary lateral incisor with 4 root canals and a dens invaginatustract. J Endod. 2015;41:1167–1171. Teixidó M, et al. The use of cone-beam computed tomography in the preservation of pulp vitality in a maxillary canine with type 3 dens invaginatus and an associated periradicular lesion. J Endod. 2014;40:1501–1504. Brooks JK and Ribera MJ. Successful nonsurgical endodontic outcome of a severely affected permanent maxillary canine with dens invaginatusOehlers type 3. J Endod. 2014;40:1702–1707. 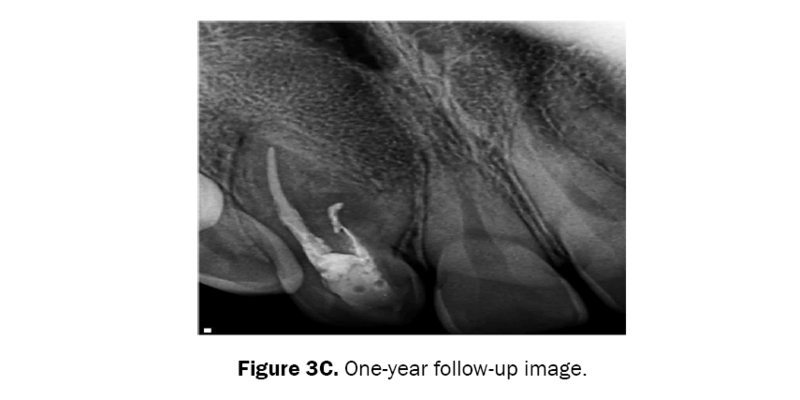 Wayama MT,et al.18-year follow-up of dens invaginatus: retrograde endodontic treatment. J Endod. 2014;40:1688–1690. Agrawal PK, et al. A rare case of type 3 dens invaginatus in a mandibular second premolar and its nonsurgical endodontic management by using cone-beam computed tomography: a case report. J Endod. 2016;42:669–672. Stamfelj I, et al. Unusual variant of type 3 dens invaginatus in a maxillary canine: a rare case report. J Endod. 2007;33:64–68.